Property 64: Villa Marrakech for 10 people with large pool, stove and internet. Elegant villa Marrakech. calm, 2 rooms in reassured residence. Wireless. Property 65: Elegant villa Marrakech. calm, 2 rooms in reassured residence. Wireless. 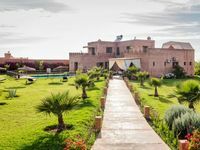 Property 70: Riad of charm any comfort with swimming pool without opposite and big sported garden. villa with private pool, view of the Atlas. Property 88: villa with private pool, view of the Atlas. Property 91: Modern villa near downtown 300M2, 1300M2 land, swimming pool. Villa ZZ apple garden with private pool. Quiet and not overlooked. Property 96: Villa ZZ apple garden with private pool. Quiet and not overlooked. Concierge Achmed is the best man.